In the last article, we mentioned the steps for upgrading BSNL 2G or 3G SIM card to 4G. Even Though it is too late, with the gradual rollout of 4G service throughout the country, BSNL also issuing 4G enabled SIM card along with that. Unlike other operators BSNL didn’t issued the 4G enabled SIM card earlier. Since all the previously issued SIM cards are either 2G or 3G, subscribers will not get 4G service on their handset even though the 4G service is available in the locality. In order to get this, subscribers need to get the new 4G sim card from the nearest BSNL office of from any other BSNl franchise. 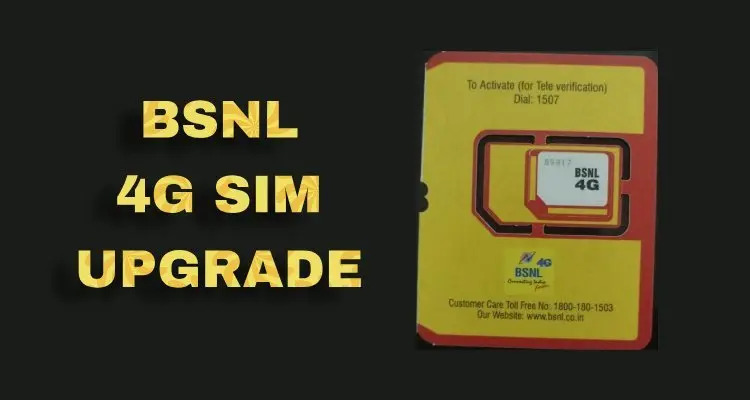 If you are still unaware about the procedure, then you can check our previous article in which you will get the information about the procedure involved in upgrading BSNL 4G SIM. To make the process easy, BSNL implemented an SMS method to upgrade the SIM in which user can do it from the home itself. But, please make sure to collect the new 4G SIM card from the outlet first. We also want to clear that there is no tricks or method to upgrade the existing 2G or 3G SIM card to 4G. The upgrade can only possible if you have a new 4G SIM card with you to enjoy 4G service on your BSNL number. Since more and more people are currently upgrading their SIM Card to 4G, there actually some network related issue also arise now. For the past few days, many users are complaining that the upgrade process is not working and they are unable to upgrade their SIM even after 2 or 3 days. BSNL 4G SIM upgrade is done via SMS method in which user needs to send two SMS from their BSNL number, the one which is going to upgrade. First message will initiate the process in which, user need to send and sms with format RE4G < space > last six digits of the new 4g sim card number < space > circle code. Upon sending this message, the user will receive an acknowledgment message which ask them to conform the process by sending the second message. In the second message user needs to send RE4G < space > YES as a confirmation. Once done, the completion of the upgrade will be done in 20 minutes or in some cases it will take up to one day. All the sms is being sent to the number 53734. Once done, the old SIM card will get deactivated and at the same time the new 4G SIM will get activated on the BSNL number. The same SIM can also be used for International roaming, so that, you can skip the international roaming upgrade of your BSNL SIM. The process involved in the upgrade is one of the simple methods in which, all of this can be completed in 20 minutes in most cases. But since the congestion in the network causing some issues. Many people are complaining that they are not receiving the acknowledgement message when they sent the first sms. So that, they are unable to send the second confirmation message. Thus by the upgrade was not at all possible. We figured out that the issue is due to the slow response of the message delivery system with the network. Hence, if you are not receiving the confirmation message after sending the first message. Then wait for 30 to 45 minute. If still the acknowledgment message is not received, then try sending the second message (RE4G < space > YES)to 53734 without waiting for that. Once you sent the second message, if your 1st request is not registered with BSNL, soon you will get an sms saying that “Dear Customer, Your request for 4G SIM swap is not found, Please send ‘RE4G < space > last 6digit SIMNO < space > circle short code’ for SIMswap request”. If you are receiving the above message, then the request is not registered. In that case, you need to send the first message again and repeat the process again. If you are not receiving any SMS while sending the second SMS ie RE4G < space > YES. Then the initial request was successfully registered with BSNL. So that the second confirmation will be successfully placed. In that case, your SIM upgrade will be completed successfully within an hour or more. But, you should also note that, since the network issue is causing the delayed sms deliveries, you will not receive any confirmation regarding the process. Just check your network signal after few minutes or hours, once the signal is lost, you can assure that the process has been completed and now, you can replace your old SIM card with the new one and enjoy the 4G service (If 4G network available in your locality) on your BSNL number. The 4G coverage of BSNL is not at all fully functional as like other operators, howver the state run telecom is trying all its way to gain their power in the field. That why the company introduced the countries first VoIP service called BSNl Wings so that the coverage issue will not be a problem any more.